Brackets are printed in Black (images shown in gray for clarity). Select angle option from 55 deg to 135 deg (Angle is measured from the front of the chair armrest down to the top of the chair armrest). Select curve distance. (Measure a 140mm straight line from one end of curve to other end, then measure distance from center of straight line to center of curve). 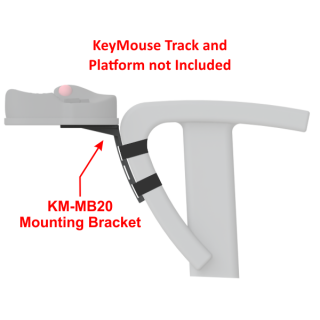 Included for each bracket are (2) velcro straps for mounting to chair, and (4) 10mm screws for mounting bracket to platform/device. Platform for Track or ChairTrack is recommended. It takes approx. 13 hours of 3D print time for each bracket to create these parts at 80% infill.